EOSC Open Consultation Results Published! Home » News & Publications » EOSC Open Consultation Results Published! Following the end of the European Open Science Cloud (EOSC) Open Consultation launched by the EOSC High Level Expert Group (HLEG) and EOSCpilot, the initial analysis of the results have been released. The analysis is only partial as it only includes the already closed part on the consultation for the recommendations put forth by the EOSC HLEG Interim Report spanning implementation, engagement and steering. Additionally, the part of the consultation concerning the EOSC Rules of Participation is still ongoing. Unlike the EOSC HLEG consultation on their recommendations, which is structured through a voting system, the Rules of Participation Open Consultation is still open. It is structured like an open discussion forum where participants can both comment, upvote or downvote certain comments. 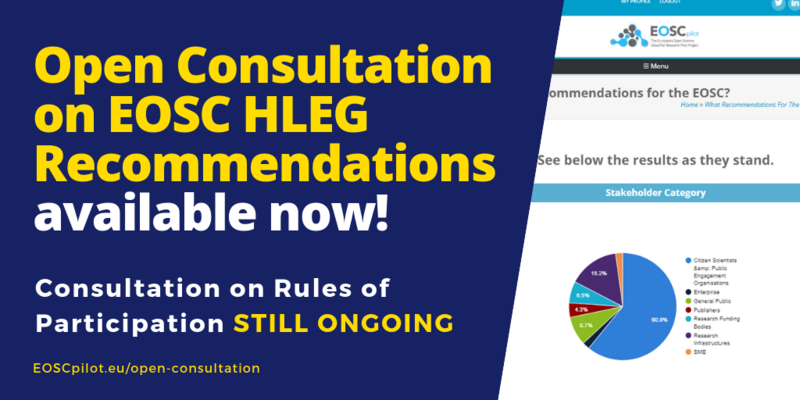 To see the preliminary results of the closed consultation, view the analysis on the EOSC Open Consultation on the HLEG Recommendations NOW!